'All Those Years Ago' is the story of John and George's relationship over the years, one year per chapter, basing ourselves on the facts we all know and then filling in the blanks at our convenience. This story was cowritten with another author, Gereiheimer a few years back. Check out the archive. Chapter twenty six (part B) : 1973, Leap in the Dark - John overcomes his fear and takes a chance but is it too late? Last edited by jonesingjay : Jul 15, 2015 at 05:19 AM. Chapter twenty-seven, 1974 (part A) : It Was Always You - John and George settle into domestic life. Paul learns the truth. All Those Years Ago: chapter twenty-eight, 1974 (part B) - A good talking to from Ringo opens Paul's eyes. John doesn't mind playing second fiddle to George. chapter twenty-nine, 1975 - John pushes to come out. George hesitantly agrees. All Those Years Ago : chapter thirty, 1976 part A - Julian visits his dad and George. John and George make a bold statement. chapter thirty-one, 1976 part B - Paul tries to make sense of Paul and George's relationship. John and Paul reconnect. chapter thirty-two, 1977 - John and George's story concludes. In a beautiful cumulation of their years together. Thanks to everyone who took the time to read this story. And, a special thank you to those who've left feedback. It's important to writers that you let us know what you think and it certainly helps to keep us chugging long. There were plans to take this story into the 80s but my writing partner decided that they no longer wanted to continue. We ended it here and it was a good place to do so. I'll be taking a break from updating content. You can check out my other works at my archive and Wattpad that is linked to in my signature. I'm currently reading 'Shelter In Your Love' a epic George Harrison centered story by Miss 'O Dell. Last edited by jonesingjay : Aug 23, 2015 at 05:32 PM. Hello, everyone! I'm back with another story for those who follow this thread. It's George Harrison centered. Fans of George and just fans of Beatles Fan Fiction in general I'd appreciate any feedback you'd like to give me on this story. The Beatles arrive in America to the likes of a fanfare that no one could’ve anticipated. Will George be able to pick up where he left off in London with Annette, a member of the black girl group The Debutantes or will The Beatles newfound overwhelming fame stateside get in the way of the plans they’ve made? Follow up to ‘Words Of Love’/‘The Nearest To My Heart’. The story begins in late January of 1964. Prologue - Fais Gaffe - George makes a big purchase. Annette tries to ease his nerves. Dearest - Chapter One, Part One - If You Can Make It Here, - George isn't feeling too hot and neither is Annette. Dearest - Chapter One, Part Two - You Can Make It Anywhere. - George makes a confession to Annette. Chapter Two - The Nightingale Sister - George has a proposition for Annette. Chapter Three, Part One - Ladies and Gentlemen, - George's plans for the future aren't met with excitement. Chapter Three, Part Two - The Beatles! - George forces Annette's hand. Annette gets up close and personal with Beatlemania! Chapter Three, Part Three - Crumbs - George and Annette make a break for it. Dearest - Chapter three, Part four - - George's evening out with Annette continues to go awry. Dearest - Chapter Four, Part One - Everybody's a Critic - Annette's issues with anxiety effect her. Dearest - Chapter Four, Part Two - You Give Back Your Ring To Me - George and Annette have a tough talk. Epilogue - And I Will Set You Free - The conclusion of George and Annette's story. And, that's all readers. I will be taking a break from posting any content here. Thank you to everyone who has taken the time to read my stories. I've noticed more hits on my Wattpad story counts. And, that's great. Also, a special thank you for the readers that take the time to leave feedback. It's very important and means a great deal to me when you take the time comment. It really helps to keep us writers who post to public forums continuing with our stories. If you don't comment. Please consider doing so in the future for writer's stories that you enjoy. They'll really appreciate it. 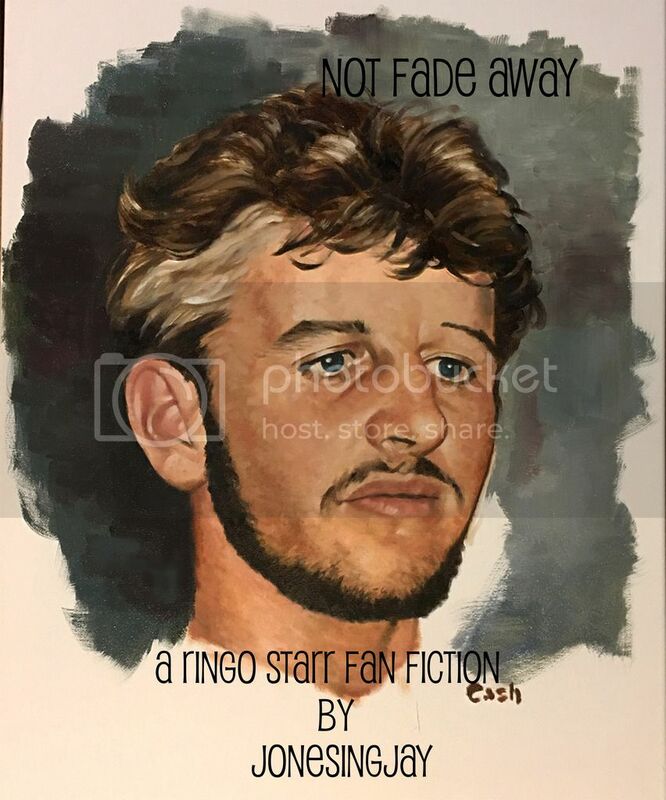 Check out Beatles Fan Fiction I'm currently reading at the moment. 'From the Ashes' by suburban-boho - Cynthia Lennon/Maureen Starkey. Femslash. They find comfort in one another after the breakdown of a marriage and a terrible tragedy. It's seven chapters in and a slow build, but these writer is fantastic. I hope you'll check it out and let her know what you think. Shelter In Your Love - George Harrison/Hannah James (Original Female Character) - by MissODell. It's an epic tale of the up and down romance of George and Hannah. No matter what they do, they just can't seem to stay out of each other's lives. There's just something that draws them back together, time and time again. This story is 40 plus chapters in and doesn't appear to be ending any time soon. Another well written story, that you should check out and comment on. Interracial. Ringo Starr, a young man from the Dingle, one of Liverpool's poorest and roughest neighborhoods has made a good life for himself. A steady gig with Rory Storm and the Hurricane's, a car and money in his pocket. He's feeling restless though. Will befriending Joan Cohen, a young woman of mixed race, change the course of his life? New and improved cover by Eric Cash.